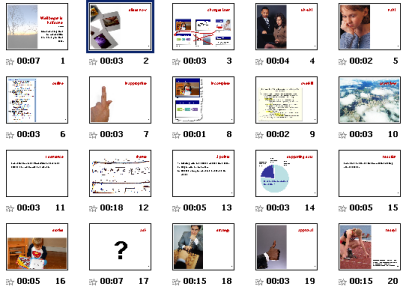 In another tip, Presentation styles, I discuss a kind of of presentation that’s fast moving, with lots of simple slides. Here I expand on that concept, with an example. 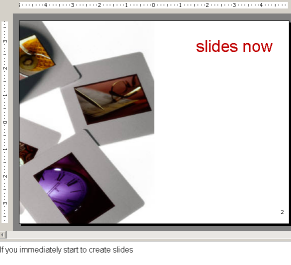 Once you know what you want to say, enter the words in the Notes pane, with about 1 sentence per slide. You can use less, a phrase or as little as 1 word. 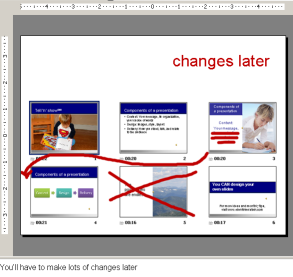 Of course sometimes, you’ll need to say more about a slide, especially when you’re presenting data. But this style works best when you keep your comments brief. The images should outweigh the words. The images should generally be large, bold, or striking. When you’re done, it’s time to practice. You’ll be moving from slide to slide very quickly, so you need to practice your delivery, probably several times. But when you get it right, you’ll deliver a very impressive presentation! 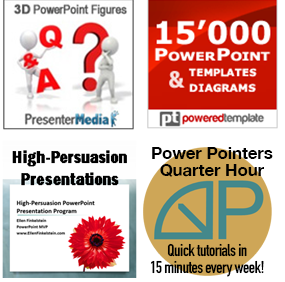 The content of this presentation is based on Point, Click & Wow! : The Techniques and Habits of Successful Presenters, by Claudyne Wilder. This book provides specific steps for focusing on your key message, connecting to the audience, using PowerPoint to help you, designing professional slide looks, creating effective slides, succeeding with technology, rehearsing, and demonstrating executive presence. With special permission from the author, I can offer you the Presentation Overview form contained on the book’s CD (PDF format). It’s a great tool for starting your presentation off in the right direction. I’ve narrated this presentation so you can see how it looks and sounds.